Whether the job is large or small, simple or complex, Copy2000 can handle the job easily. We feature four high speed digital copiers and a duplicator, with the combined speed of more than 10,000 copies per hour, to ensure top quality reproduction. Copy2000 can perform copy jobs that are doubled sided, require enlarging and reducing the size of the original, printing and copying tabs, collating, folding, and stapling the copies, while reproducing text and graphics with excellent clarity. Unlike our competitors, we do the job immediately without delay. Our fast same-day turn-around time makes us one step above the others. We also offer a variety of papers to suit your needs, please visit the paper selection page. 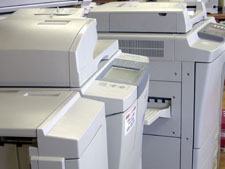 If you have a few copies to make and in a hurry, you can use our self service copiers. Compare the color original (top) with a copy made from a standard black and white copier (middle), and a copy made from our digital copier (bottom). You can clearly see the difference between the quality of copies made by regular copiers and digital copiers.